Starting times may be made by calling the pro shop at 304-754-7222. For lesson packages & private group practices customized to fit your needs please contact Joanne directly at the e-mail address listed below. Rates do not include 6% sales tax. Joanne Eberhardt is originally from Randolph, NJ and joins us from Overbrook Golf Club in Villanova, PA where she served as Assistant Golf Professional and Director of Youth Golf. Joanne graduated from Sacred Heart University in Fairfield, CT where she played Division 1 college golf and completed her undergraduate and graduate degrees in Elementary Education. She has been a member of the LPGA since 2011 and is passionate about growing the game of golf with youth and beginner golfers as young as three years old. She was a U.S. Kids Golf Top 50 Honorable Mention Recipient in 2014 and 2015. Joanne and her husband Seth along with their son and dog reside in Martinsburg, WV. 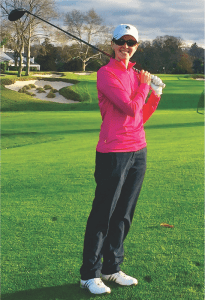 To inquire about lessons or clinics, contact Joanne directly at joannegolf@outlook.com.